Dr. Nary was born and raised in St. Louis, Missouri, as was his wife Gwen, and they were married there in 1987. Dr. Nary practiced dentistry for four years in St. Louis until moving to the mountains of Colorado in 1994. He maintained a private practice in Breckenridge, CO for the past 21 plus years providing all facets of general dentistry. While in Breckenridge, Dr. Nary and Gwen were blessed with four wonderful children, two of which now attend college and two in elementary and high school in Greenville. Dr. Nary and Gwen elected to move to Greenville in 2013, even while Dr. Nary continued to practice in Colorado, to provide their two youngest children the opportunity to attend excellent schools in the Upstate. Dr. Nary joined Family Dental Health in September 2015 and has thoroughly enjoyed his move to the Upstate and all the wonders it has to offer. 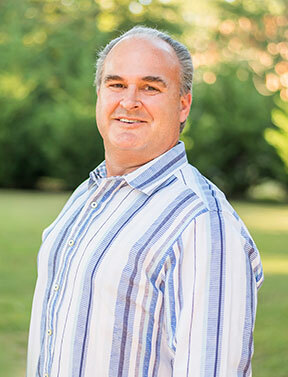 Dr. Nary enjoys cycling, hiking, hunting, watching his boys play lacrosse, and attending college football games. Dr. Nary remains centered on his family through their faith. Dr. Nary has been a member of DDS, Donated Dental Services, providing comprehensive free dental treatment to the disabled, elderly and medically fragile in his community since 1994.